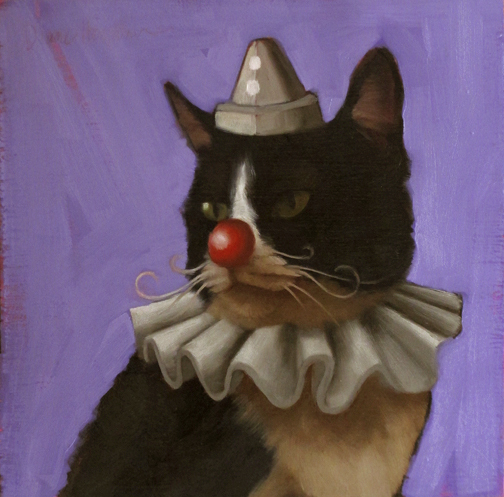 As the eldest cat on the carnival circuit, he takes his job very seriously but "Carnie Cat" is all clown. He tips things over and performs stop motion antics to the delight of crowds far and wide. This one made me laugh out loud! So much fun you're having - thanks for the smiles! Ha! Wonderful painting, I can see a new series of these in your future. Wonderful side stories to the images too... smiling all day now. Diane I love this new series! Carnie Cat is fantastic, I love the hat with that attitude you captured in his expression. Beautifully painted as always! These kitty characters are something else!!! - Bringing lots of giggles - I find I look forward to each one & wonder what you'll come up with next!! Awesome!